Cyndi Corcoran works with physical therapist Elizabeth Watson during a demonstration using a bionic suit at Magee Rehabilitation Hospital, Thursday, Dec. 6, 2018. Corcoran, who has no sensation in her legs, is able to walk with the assistance of the suit. Once a week, Cyndi Corcoran gets to walk again for at least an hour, thanks to modern medical technology and her own unflagging determination. 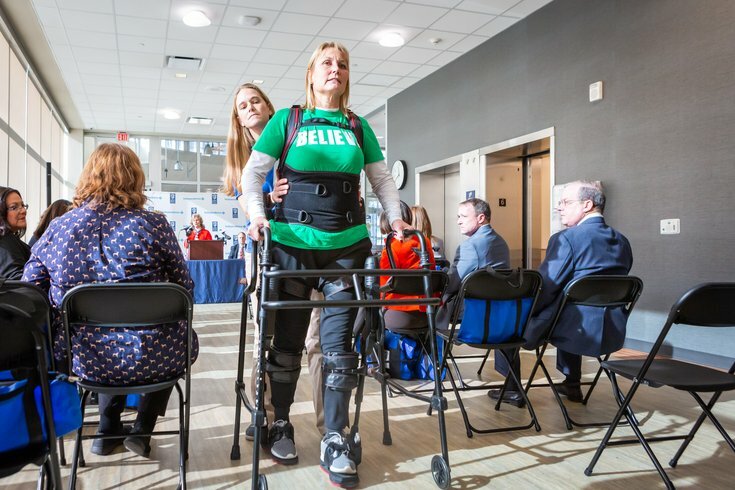 At other times, Corcoran – who is partially paralyzed due to a spinal cord injury – will sit at Magee Rehabilitation Hospital in Center City waiting for a cancellation to free up the bionic suit that empowers her to get back on her feet. "It's given me the freedom to get up and walk and practice a proper gait," said Corcoran, who has been using the suit for nearly four years. "This allows me to retrain the brain and really practice the repetition of walking with a good gait." For Corcoran and some other patients with spinal cord injuries, the bionic suit offers a potential path toward one day walking on their own. To others, the suit offers a plethora of wellness benefits, even if they have little chance of ever walking again. And it also helps stroke patients regain a more natural gait. But the suits are expensive and, at Magee, patient demand for the suits outweighs supply. Until Thursday, Magee only had two bionic suits – one at each of its inpatient and outpatient facilities. That's when Independence Blue Cross formally announced a $140,000 contribution to The Jerry Segal Classic, a fundraiser that has raised more than $17 million to benefit Magee patients. The donation will help Magee purchase an Ekso Bionics GT suit – the latest bionic suit. Yet, after watching Corcoran use a bionic suit at the press conference, IBX President Dan Hilferty pledged to purchase another bionic suit immediately and raise support for a third new suit. The news brought Corcoran to tears. "I'm one of the patients that will stay down there and wait for a cancellation just so I get another hour," Corcoran said. "It means a lot. If you could only walk one hour a week, you know?" Magee currently has a waiting list to get into the outpatient program that utilizes the bionic suits, physical therapist Elizabeth Watson said. Once in the program, patients get the use of a suit for one hour each week. Given Magee's reputation and the need for additional bionic suits, Hilferty said the decision to partner with the hospital was "an easy one." "It's important that the waiting time goes down and that folks have access to not only the miracles that Magee produces, but this incredible equipment," Hilferty said. The suits – which are adjustable to fit varying body types – allows patients to gain proper balance and body conditioning as a physical therapist uses a program to establish desired walking parameters, like step length and speed. When the patient has achieved proper balance, a beep sounds, allowing the patient to know they are in the correct position to make the next step. That allows them to look forward as they walk. Because they cannot feel their feet, they otherwise would need to look at their feet as they walk. Therapists can adjust the suit's settings to make the session more strenuous. "That's retraining my brain," Corcoran said. "That's the repetition part that's so crucial in your recovery. Without it, my muscles do not need to work. They do not need to get that signal from the brain, because I can adapt without it." But she doesn't want her brain to adapt to her paralyzed condition. A longtime athlete and former physical education instructor, Corcoran said adjusting to therapy has been challenging. The recovery from a spinal cord injury is a long process, she said. When she was able to wiggle a toe for the first time, that was "big to me." "That has been the hardest part of my recovery, to know that it's not like a broken bone," Corcoran said. "It's not going to heal in four to six weeks. But you can't give up. Knowing that even if I only get to walk one hour a week, that is so important because you're retraining the brain."